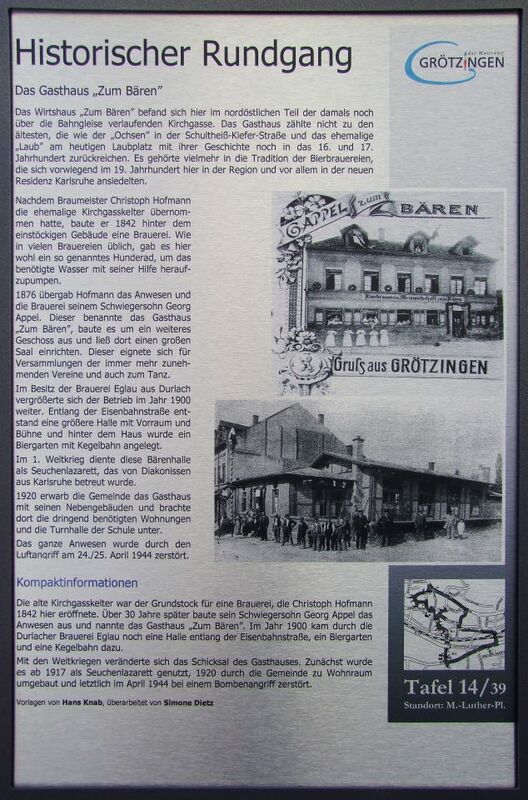 The Tavern "Zum Bären" was located here in the northeastern part of the then over the railway tracks running Kirchgasse. The inn was not one of the oldest, its history reaching back as the "Ox" in the magistrate Pine Street and the former "foliage" today still leaves space in the 16th and 17th centuries. It was rather in the tradition of breweries who settled mainly in the 19th century here in the region and especially in the new residence Karlsruhe. After brewmaster Christoph Hofmann took over the former Kirch gas Kelter, he built in 1842 behind the one-story building a brewery. As usual in many breweries, there was probably a so-called Hunderad to heraufzupumpen the required water with his help. 1876 ? ?Hofmann gave the estate and the brewery to his son Georg Appel. This called the restaurant "Zum Bären", it expanded to another floor and left it there to set up a large hall. This was suitable for gatherings of increasing use of teams and also to dance. Owned by the Eglau brewery from Durlach, the operating enlarged in 1900 on. Along the railway line was a larger hall with entrance hall and stage and behind the house is a beer garden with bowling has been created. In the first world war, these bears hall served as a plague hospital, which was supervised by deaconesses from Karlsruhe. 1920 purchased by the City, the guest house with its outbuildings and brought there under the much-needed homes and the school gym. The entire property was Due to the air attack on 24/25 April 1944 destroyed.